Lordy, lordy, Judge Ginger ordered Heebe to send Nowdy a Valentine – not really but sorta! IT IS ORDERED that Plaintiffs provide the Court with a floor plan of the third floor of 2000 Belle Chase Highway by Monday, February 14, 2011 by 10:00 a.m. ♥ If the Government has a floor plan of the third floor of 2000 Belle Chase Highway, it shall also provide a copy to the Court by Monday, February 14, 2011 by 10:00 a.m. IT IS FURTHER ORDERED that the Government provide a detailed inventory of what it seized from the premises of 2000 Belle Chasse Highway. That inventory shall indicate what was seized, from where it was seized, and on what basis the Government concluded that the seized material was related to River Birch, Inc. It shall also indicate which items have already been returned to Plaintiffs. This inventory shall be submitted in the record by Monday, February 14, 2011 by 10:00 a.m.
After reviewing the Government’s inventory Plaintiffs shall submit a memorandum regarding what seized items they believe should be returned pursuant to this Court’s previous Order by Wednesday, February 16, 2011 by 12:00 p.m. IT IS FURTHER ORDERED that the Government provide the Court with a status update of the review of allegedly privileged documents seized from the third floor of 2000 Belle Chase Highway by Monday, February 14, 2011 by 10:00 a.m. 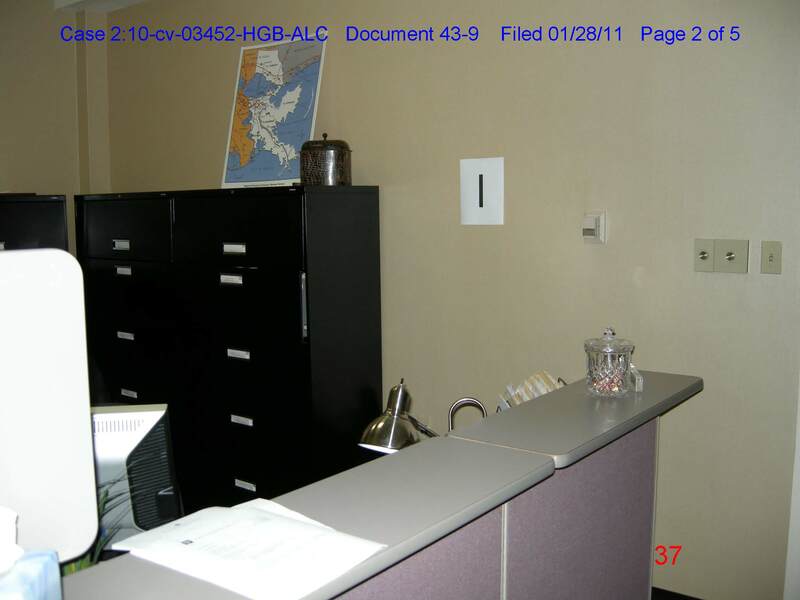 IT IS FURTHER ORDERED that Plaintiffs shall submit a memorandum explaining the presence of several filing cabinets and file folders containing River Birch, Inc. materials located at 2000 Belle Chase Highway during this Court’s site visit on February 4, 2011. Specifically, during that visit the Court noticed several black filing cabinets that had various labels related to River Birch, Inc. These black filing cabinets were located in the area labeled “I” during the Government’s initial search, which the Court believes was the former law office of Peter Butler. 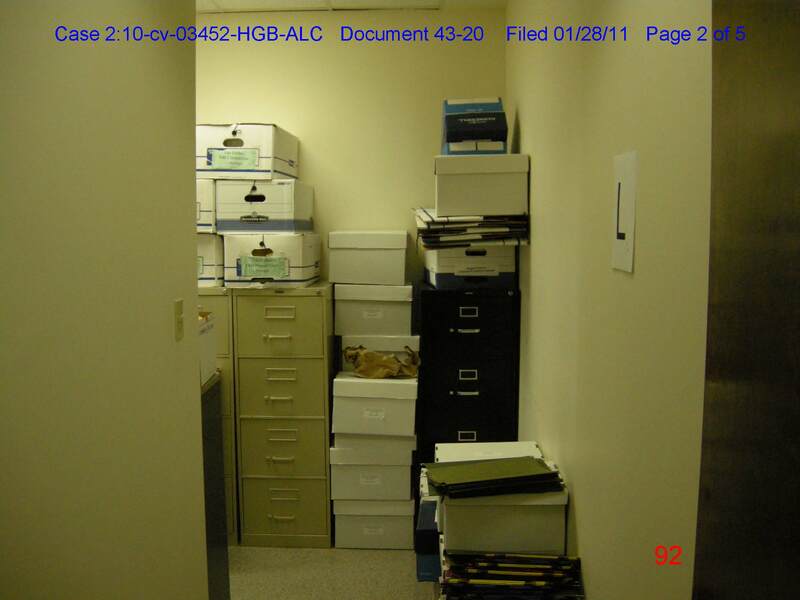 Also the Court found a tan filing cabinet, which contained numerous River Birch, Inc. files. This filing cabinet was located in the storage room labeled “L” during the Government’s initial search. In this memorandum Plaintiffs shall explain whether these files where seized and subsequently returned, generated after the Government’s search, or not seized in the Government’s initial search. This memoranda shall be submitted to the Court by Monday, February 14, 2011 by 10:00 a.m.
Judge Ginger’s last order has to mean she really focused on the Government’s pictures (and thought to herself, “Oh deargod the place was such a mess what did the Government clean”). A “clean team” – not to be confused with a cleaning crew – “is a group of specially-trained FBI agents whose only job is to cleanse crime scenes after evidence is collected. Part police officer, part detailer, part lawyer every member of the clean team works to insure the integrity of the state’s case”. IT IS FURTHER ORDERED that the Government shall submit a memorandum explaining why a “clean team” was present during the initial search of 2000 Belle Chase Highway and what instructions the “clean team” was given regarding the search. This memoranda shall also explain how the “clean team” and regular investigators interacted in conducting the search. This memoranda shall be submitted to the Court by Monday, February 14, 2011 by 10:00 a.m. Comment away. I’ll be back with an update after I scout up photographs of the office marked “I” and the storage room marked “L”. “It is important to note here that clean teams have nothing whatsoever to do with torture. Could it be that the Judge will become a witness in the RiverBirch case? Can she be the Judge and a witness in the same case? This is huge Nowdy. Great scoop. JudgeGone, she must have the vision of “Superman” and a photographic mind . Alas, my fate, to not understand what I’d be certain to appreciate! Meanwhile, I continue to contemplate the thought that I’ve reached a point in my life that I’m looking forward to a “Be Mine, Valentine” floor plan – If you think that would sound better in French, have at it! I’m just found the answer that question, NAAS. Stand by for another RB post. Previous Previous post: I just had the most amazing conversation with the Lafayette Square Wino….